Furminator I got one and...? I LOVE it! I got one side of Harley done (one full bag later ) and I can pet her now and no fur comes off . Crazy all her under coat is coming off. She must feel sooo much better now poor girl. I was holding the fur in my hands and it was sooo hot. Now I have to get the cat done. Re: Furminator I got one and...? Wanna do my Kira too? I love my furmy! you can use these on short haired dogs too? hmm I don't know, I wouldn't use it on a dane. Not sure about a rotti. I would go to a pet store and see if they have one that you can try out before you buy as it is quite expensive. The girl at the pet store showed us how it worked on her dog and I was sold Her dog and Harley had similar coats. I'll have to take a picture of all the fur that has come off Harley and post it. No wonder my I have been sweeping and vacuuming almost every day! I got one a while ago and this is what I got off of Ruffian on my first night, I did the same for 2 more nights, LOL. On a side note Bamboo makes one as well that has interchangeabl e blades so you can switch from a small to a medium or large blade if you have different sized pets. I groomed my rotti with a furminator and it worked great! How about on Newfies? I thought I read in an earlier post that it didn't work well on Newfs. I bought a Mars king coat and even tho I was gentle, I didn't even press to the skin, my bubs thought I was torturing them after a few passes with it. I'm happy to try the furminator or perhaps someone knows the proper way to use the Mars King coat, also not a cheap tool. I've been brushing these guys almost everyday to some degree. They used to like it. Now they squirm to get away. I have the furminator and I've used it on all of mine. I really only use it on Gunther when he's shedding heavy, and that's usually near his rear end. you aren't supposed to be pressing real hard anyway so it doesn't seem to bother him at all. On Keiko i still prefer a rake. the furminator on her seem to make her coat more coarse. And although it's not supposed to, it does take off topcoat hairs as well as undercoat. "Life is short, Buy the shoes!" I got mine a few days ago and I am enthralled! I used it on my golden, my newf/border collie mix and both of my short haired cats and it worked with all of them! I also bought the Cat Zoom Groom and it works as well on the cats, but I hated how the hair was hard to get off the zoom groom. I am sticking with the Furminator. I got a medium and it is a great size! I ordered a medium size Furminator for our dogs and cats about 4 months ago and I LOVE it! It works wonders on our cats, I can see and feel the difference afterwards. It's fantastic on Zoey my Alaskan Malamute. 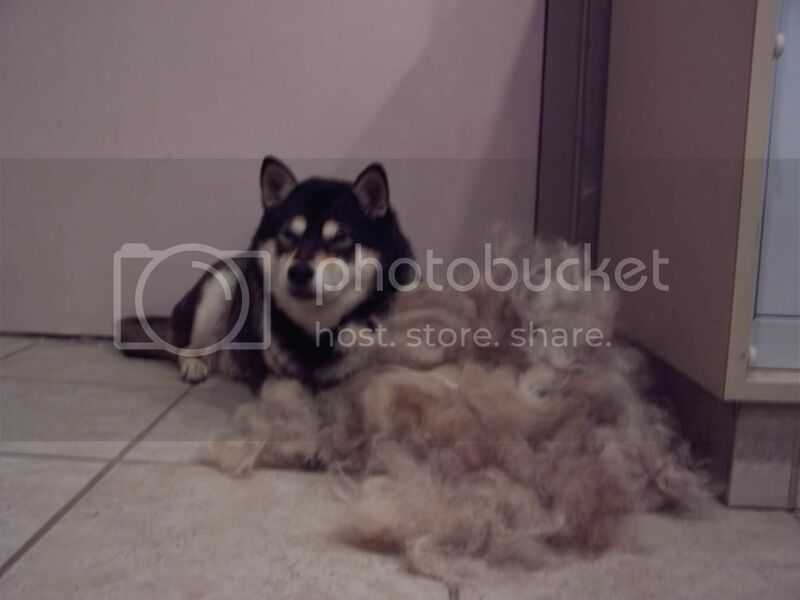 Huskies, Mals, and other breeds with water-proof guard hairs and short undercoat like nordic breeds are PERFECT for this brush in my opinion. When Zoey was blowing her coat, the Furminator helped immensely. I too have heard that on really long-coated breeds, this brush doesn't work too well. On Dolly my Saint, it works okay. Just okay. It helps a lot on her belly and the fur near her back legs, but I usually prefer our slicker brush for her. Furminator would probably be okay on Rotties and I have a friend who used it on their Lab and the dog loved it and the fur was flying! But dogs with really short fur like Danes, GSP's etc. probably wouldn't appreciate this brush. I tried it on my newf and it does work great but it kinda splits the hair on the top, giving it that split end look, so not so good for show dogs, but pets it works awesome. I find the undercoat rake and a bigger toothed comb work well also. The comb doesn't hurt the skin and it gets down to the skin. I find the undercoat rake and a bigger toothed comb work well also. That is what I use on Tank and what my Grandparent's use on their longhaired and doublecoated dogs. It works great and gets all the loose winter hair out! Sorry, newbie here. don't know where else to test this stuff out. I tried to find something clever or thought provoking to say; but it's harder then you might think. I'll keep trying though. I use the furminator on Puck and it does an amazing job. I would never use it on Rosie or Farley though.